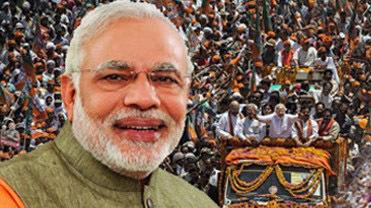 Today marks the culmination of a long campaign for 2014 Lok Sabha Elections. I addressed my final rally in Ballia, the land of the hero of 1857 Mangal Pandey, in Eastern UP. Since September 13th 2013 when the responsibility of being the BJP’s PM candidate was given to me, I have been travelling across the length and breadth of India. Friends in the Party told me that I have addressed rallies and programmes in almost 5800 locations, covering a distance of over 3 lakh kilometers. The number of rallies I addressed in this campaign season is 440, including the Bharat Vijay Rallies that I began with the blessings of Maa Vaishno Devi on 26th March 2014. The campaign was a wonderful opportunity to once again witness India’s celebrated diversity, the vibrancy of the people and the beauty of our culture. Working for the Organisation I have travelled across India in the past but this time it was very different. The unprecedented blessings I have received from the people have been very humbling. Conventional wisdom would suggest such a campaign would be tiring but I am experiencing a deep satisfaction and freshness that one would feel after a long and elaborate Sadhna. Through the campaign I got to worship the Janata Janardan. When I look back at the entire campaign, three words come to my mind – Extensive, Innovative and Satisfying. Throughout our campaign, we took agenda of development and good governance to every corner of India. People are tired of false promises, corruption and the same old tape-recorded messages ridden with dynastic references only to hide one’s own failure. They want a better tomorrow and NDA is the only alliance that can provide this change. Nothing made me more glad than seeing the enthusiasm of our Karyakartas! They have worked tirelessly throughout the campaign. Seeing a rally on TV and social media is one experience but working on the ground is something out of the world! We do not view campaigns through the limited prism of electoral victory or defeat. A campaign becomes a life changing experience for the Karyakartas. It is a golden opportunity to strengthen and expand the Organisation and increases the bond between the people and the Karyakartas. Our Karyakartas went door-to-door and spread the Party’s message and we are very proud of them. Our campaign is the story of the hardwork of each and every BJP worker, who has selflessly set out to create a better India for future generations. In the entire campaign we received the continuous support and guidance of the leaders of the Party. We derive immense strength and inspiration from the solid experience and wisdom of our leaders and their active participation in the campaign gave us an impetus and boosted the confidence of Karyakartas. This campaign will be remembered for path breaking innovation. In a polity where political campaigns were more about one-way communication, our Chai Pe Charchawas an innovative break from the past. Charchas were held in over 4,000 locations across India. During these Charchas, I sat for hours and heard the views of the people and then answered their questions on a wide range of issues. One of the Charchas was held in Wardha (Maharashtra) where I met families of farmers who had committed suicide. I was really saddened. After so many years of freedom, our farmers are still ending their lives even as the present Government watches on silently. For how long can we let this go on? Innovation was seen in the Bharat Vijay 3D rallies. In one month I addressed 12 rounds of 3D rallies covering 1350 locations. The response to the 3D rallies was phenomenal. So many youngsters wrote to me on mail and social media ‘thanking’ me for coming to their village. People told our Karyakartas- we want to meet Modi ji on stage…such was the buzz these rallies generated. For the first time in the history of Indian electioneering an exclusive volunteer portal was set up in the form of India272+ (http://www.india272.com). All one had to do was log in and begin work either online or by participating in the onground activities. Through India272+ we sought inputs from our volunteers. I was truly enriched by their ideas and contribution. Such forums have the potential to revolutionize campaigning and create a paradigm shift in interfacing and mobilizing well-wishers. It was amazing how all forms of social media were innovatively used throughout the campaign. This includes the ever popular WhatsApp- a lot of friends showed me innovative WhatsApp messages, campaign slogans and infograhpics that were hugely popular. After casting my vote I shared my own Selfie and called for your Selfies. This generated tremendous buzz on social media. I also had a free and frank interaction with several friends from the print and electronic media. I was interviewed by the Hindi, Regional and English media. I cannot forget the affection I have received in the last eight months. The events of Patna will remain etched in my memory- there were live bombs on one side but the resolve of the people prevailed. Nobody left the venue of the rally. I had a clear message that day that I repeated often during the campaign- we can decide whether we want to fight each other or we want to unite to fight poverty? The former will lead us nowhere while the latter will take our Nation to greater heights. Most importantly I wish to thank the people of India who joined our rallies, 3D events and Charchas in large numbers. People cutting across all age groups and transcending barriers of caste, creed or religion joined us. I often said that Narendra Modi or any one else is not fighting these elections. The people of India have taken these elections on their shoulders. Each and every citizen of India has become a driving force of change. In most places where I addressed rallies, it was very hot yet people came in record numbers. A few days ago when I was in Visakhapatnam, it suddenly started raining during the rally. Yet the people remained. No words will be able to convey my gratitude to the people. I assure the people of India that I will repay this overwhelming affection with unprecedented development that will lay the foundations of a strong India. The campaign has ended today but one phase of the Elections remains. I urge all those voting in the final phase to vote in record numbers, especially the youth. Please go to vote, take your family and friends to vote. Every vote matters! As I travelled across India I could not help but think- there is something in this soil that makes India special. History is full of examples of how our land has shown the way to the world and today once again, our destined role of a Jagad Guru calls us. Let us rise to the occasion and create a strong, developed & inclusive India that will show the way to the world.